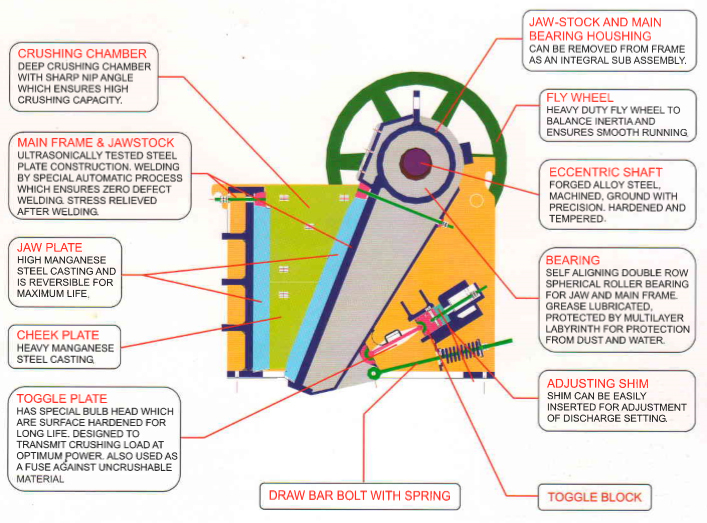 The Sisco single toggle jaw crusher is acknowledged in its field. Equipped with anti- friction bearings and fabricated all-welded steel construction duly stress relieved, which not only gives added strength but eliminates any risk of costing failures. Apart from exceptionally hard materials, for which the Sisco crusher is the ideal machine, if meets practically every requirement of the Quarry, Grovel plant, Construction and Mining fields. The capacities given ore based on material weighing 1. 6tons/cubic metre (Granite). The Horse Power required varies with the Hardness and other characteristics of Rock/Ore to be crushed. The percentage of oversize in crushed product will vary with the natural characteristics of rock or ore crushed. No Crusher will give a product all of which will pass a screen cloth of the same opening as the discharge opening to which the Crusher is set. To get different sizes of product the discharge gap has to be adjusted by adding or subtracting shims placed behind the toggle Block .Two adjusting bolts on both sides of the shims are tightened to replace or add shims. After the required gap is achieved then these bolts are loosened before operating the machine. A good quality bearing grease should be used for the eccentric shaft bearings. All bearings are protected from dirt or dust by oil seals mode from special Neoprene Rubber. Heavy duty, self-aligning spherical double row roller bearings ore used in the main frame and jawstock assembly respectively. The large diameter eccentric shaft is mode from high tensile, forged Alloy steel to withstand the stress and strain of crushing. The Jawstock is of welded mild steel construction and stress relieved. lt is accurately machined to provide o perfect fit for the Jawstock bearings and manganese steel jaws. The Chassis is mode of M.S. Joists and other rolled steels section. Triangular draw-bar with forged steel Tow Hook is provided. For swiveling, the choses is provided with turntable pin, for easy maneuver. Pneumatic wheels ore mounted on two square axles with roller bearing. 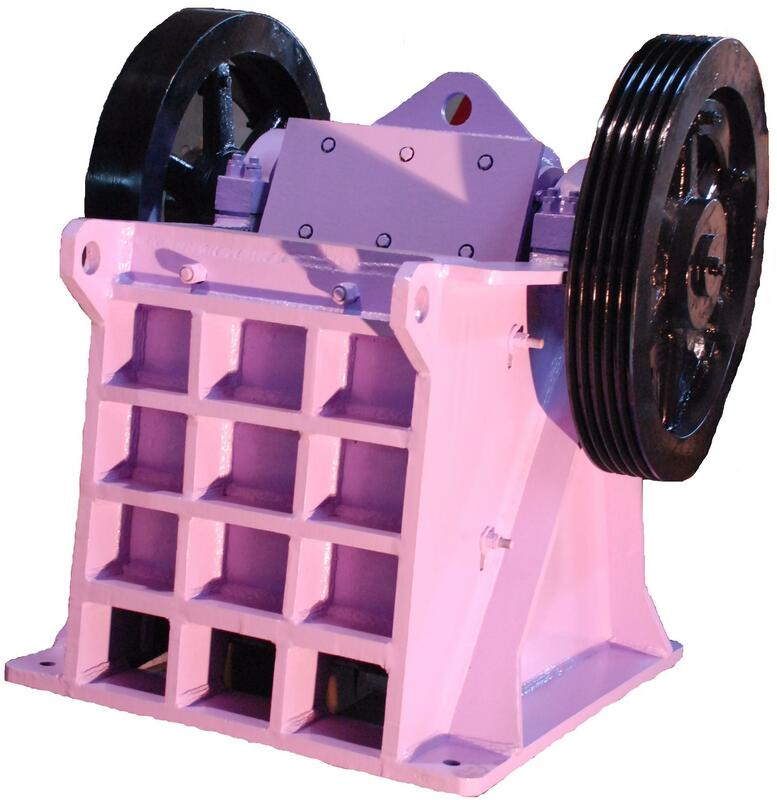 Diesel Engine or Electric Motor is normally supplied with these portable Jaw Crusher. The Crusher and the Engine are rigidly bolted on the chassis. The drive is effected by flat rubber belt or V-Belt. Belt gourd for protection against accident is provided. The screen is punched from 5 mm plate, mounted on o 63 mm dia. Shaft by cast irons stays. Drive is mode by a pair of cost bevel gears and pinion from a pulley attached to one side of the flywheel through belt. The dia. of the screen is762 mm and 2440 mm in length. The whole length is divided into three gratings of 609 mm, 914 mm and 91 mm lengths with 38 mm overlapped by dust jacket on the intake side, with standard size of holes (13 mm, 19 mm, 25 mm, 38 mm,63 mm). The perforation on the screen can be changed as per customer requirement. Stationary Screens of size upto 915mm dia x 4880mm length is available with stationary systems. Bearings are self-aligning, under-slung bushes with lubrication system.